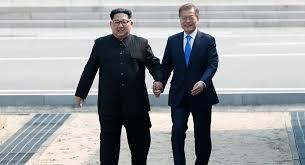 After six decades of conflict after Korean War, the North Korean leader Kim Jong Un crossed the border in between the Demilitarized Zone to meet South Korean President Moon Jae-in. The isolated state Nokor finally came into surfaced to welcome the world. They both shook their hands and exchange pleasantries while offering their territories to step in in the DMZ and granted vice-versa. The expression shocked the world since the long political manifesto had shaken into a world war of nuclear weapon. Moon and Kim will discuss three topics during their meeting: denuclearization on the peninsula, the establishment of sustainable peace and an improvement in relations, including Nokor should give up their nuclear weapons.